Area actors need to warm up those monologues! Illinois State University is in the middle of auditions for all its winter and spring shows right this minute, and Heartland Theatre is holding auditions for Donald Margulies' Time Stands Still in mid-December. Plus Community Players' will be looking for performers for Ken Ludwig's Lend Me a Tenor December 10 and 11. 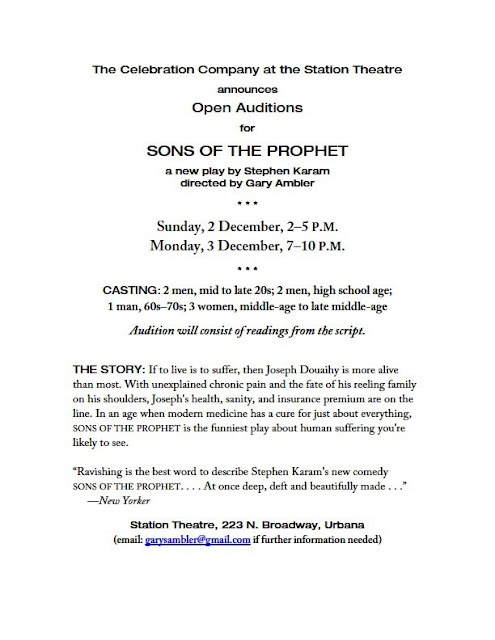 Meanwhile, on Sunday, December 2 and Monday, December 3, Urbana's Station Theatre will hold auditions for Sons of the Prophet, a new comedy-drama from playwright Stephen Karam. A finalist for the 2012 Pulitzer Prize for Drama, Sons of the Prophet was billed as "a refreshingly honest take on how we cope with wounds that just won't heal" when it played at New York's Roundabout Theatre. The Roundabout's poster for the show -- with its garden gnome sporting a black eye -- was so adorable I'm posting it here just for kicks. That production was quite successful, amassing lots of wins and nominations for Obies, Lucille Lortel Awards, Drama Desks and Outer Critics Circle Awards. Lead actor Santino Fontana was especially well received. The Station has picked up the Roundabout's material on the play for their audition flyer, with this description: "If to live is to suffer, then Joseph Douaihy is more alive than most. With unexplained chronic pain and the fate of his reeling family on his shoulders, Joseph's health, sanity, and insurance premium are on the line. In an age when modern medicine has a cure for just about everything, Sons of the Prophet is the funniest play about human suffering you're likely to see." Karam's play's title refers to Kahlil Gibran's book "The Prophet," with the play's action organized around the chapter headings in that poetic piece of pop philosophy. Joseph Douaihy is one of two brothers in the play, the older at 29, with Charles only 18. The family is Lebanese-American and claims a distant familial connection to Gibran, which informs part of the plot when Joseph is pushed to write a book himself, but is challenged by his own mysterious illness and his mentally unstable editor, who also happens to be his boss and therefore holds the key to his health insurance. Joseph, who is gay, lives with Charles, who is also gay, and their ornery uncle in a not-at-all nice area of Pennsylvania, thrown together after Bill Douaihy, Joseph and Charlie's dad, passes away. How he dies is important, but tricky to explain. It seems a local football player left a fake deer on the highway as a prank, Bill saw it while driving and swerved to avoid it, had a crash, and then died a week later in the hospital. But he died of a heart attack. It's all part of Karam's inquiry into the crazy nature of Fate or Luck or Destiny or whatever you want to call it, as those cosmic forces keep ladling out big helpings of bad news to the Douaihy family. 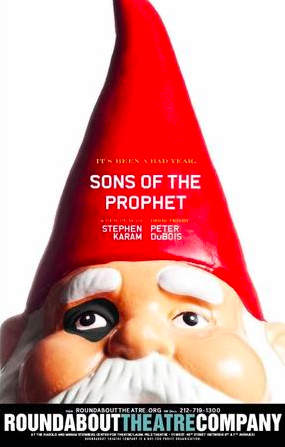 If the family is drowning in tragedy, what sets Sons of the Prophet apart is the comedy, and how Joseph and his kin manage to find a life raft in humor and in each other. 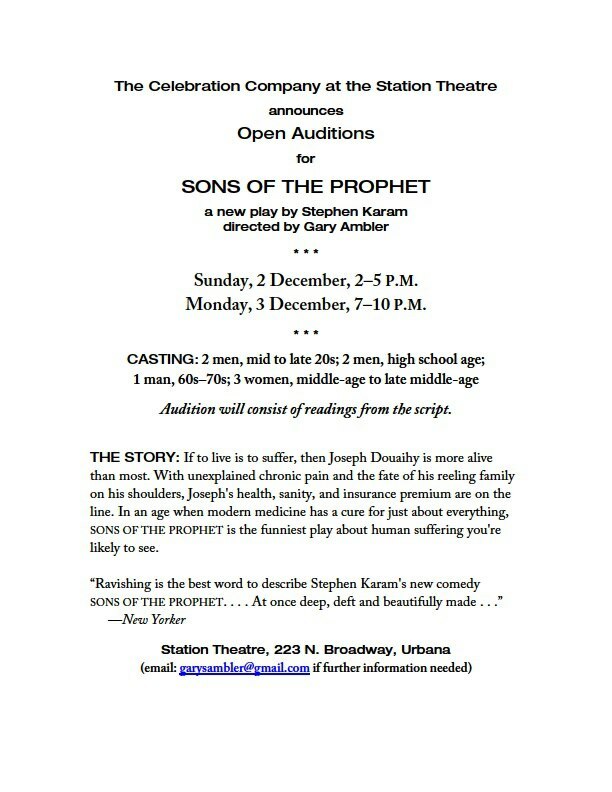 Sons of the Prophet will be directed by Gary Ambler for the Station Theatre, with performances from February 21 to March 9. Roles available include Joseph, Charlie and Uncle Bill, as well as Vin, the 18-year-old football star who caused the accident; Gloria, 59, the crazy editor; and Timothy, a local TV reporter who offers romantic complications for Joseph.